CUMBERLAND — With seven seniors, a perfect record and a sweep of nine-time-state-champion Greely, the Biddeford volleyball team had a lot to feel good about Thursday after beating the host Rangers, 26-24, 25-21, 25-17. Shaw, who started the Biddeford program in 1999 and led the Tigers to two state championships and the 2010 Class A state title, said her team looked powerful, cohesive and scrappy – refusing to give up on a single point. Greely’s Katie Fitzpatrick spikes the ball during Thursday’s match at Cumberland, as Biddeford’s Lexi Matteau and Grace Boisvert, right, try to block. Biddeford (3-0) led at virtually every point. In the first set, Greely (1-2) took a 2-1 lead, but it didn’t last as Biddeford quickly made it 7-2 off two Grace Martin kills. The Tigers led the rest of the set. Greely senior Morgan Selby won five service points in a row to help the Rangers pull within two, but Martin was repeatedly at the net with a drop-in shot and Chantel Perreault added an ace to help grow the lead. The second set was even more decisive. Biddeford took the early lead, and other than Greely tying the score twice, the Tigers led the entire set. 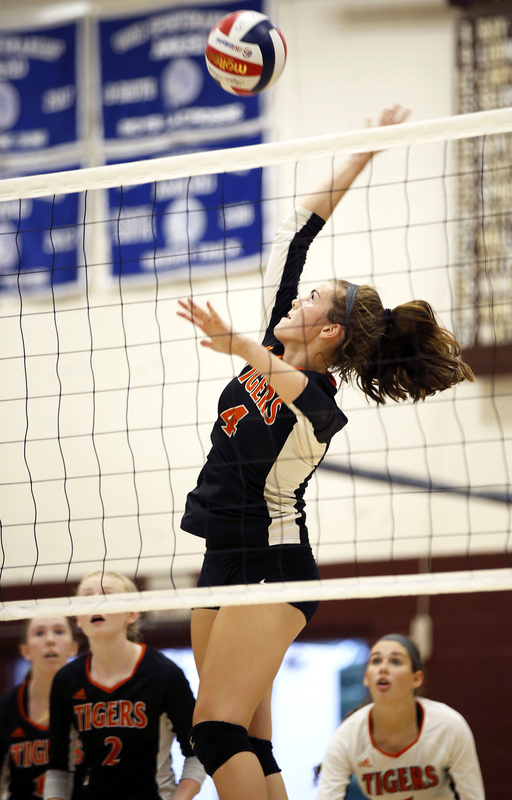 Biddeford’s Grace Martin spikes the ball Thursday during a match against Greely. Biddeford won 3-0. Selby added two kills early, but the Tigers controlled the pace to take the set. Biddeford middle hitter Sydney Gagne opened the third set with an ace – and that set the tone. 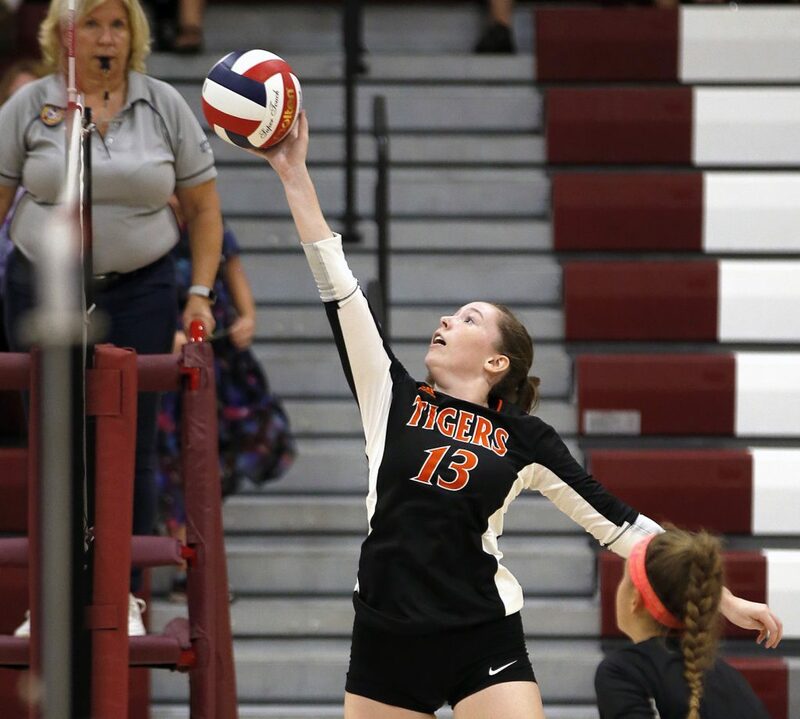 Selby again stepped up for Greely – with two aces early to make it 3-2, but two Greely mistakes and two Martin kills gave Biddeford a 7-4 advantage. In the final set, the Tigers led by as many as 10. Martin, who finished with 13 kills, said her team is passing even better, making it that much easier for her and other hitters to win points. 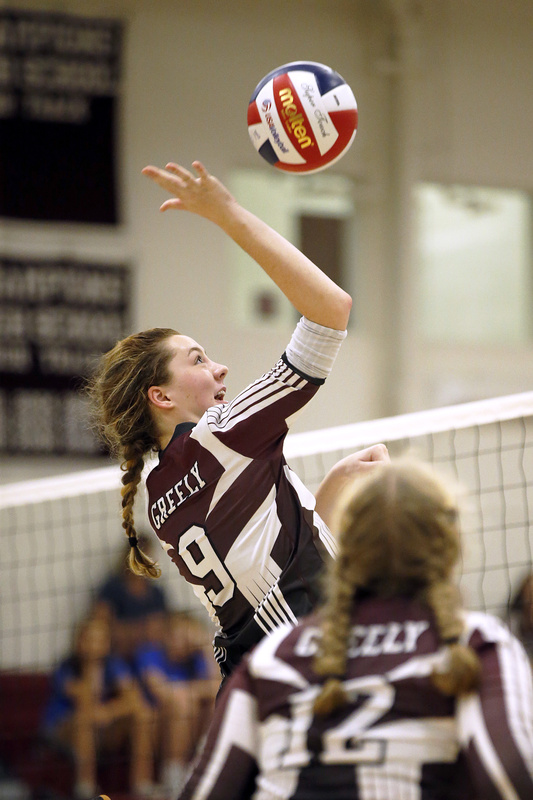 Greely’s Mackenzie Ludwick spikes the ball on Thursday during a home match against Biddeford. Greely Coach Kelvin Hasch said the Rangers were not on their game and made too many mistakes.